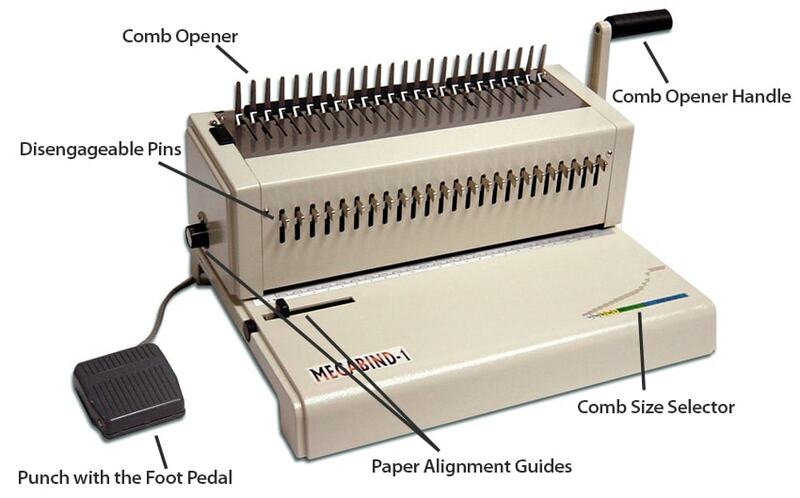 The Megabind 1E is an electric comb punching machine, meaning that instead of using a handle to activate the punching pins and punch your paper, this is done electronically using a foot pedal. The binding mechanism, like all plastic comb binders, is manual and activated by the simple pull of a handle. The electric capabilities and tough metal construction make the MegaBind 1E Binding Machines a great addition to any medium to high volume environment, such as large offices or print shops. It also has the capability to punch and bind paper sizes up to 14” wide, so those legal size documents are easily handled. You can bind books as large as 2” thick, or approximately 425 sheets of 20 pound paper, in a snap with the MegaBind Electric. All 24 punching pins are disengageable, making punching and binding those smaller or odd-size books easier than ever before. This feature is extremely important when binding sheet sizes other than letter size (8.5” x 11”) and legal size (8.5” x 14”). It allows you to disengage a punch pin (or multiple punch pins) to remove the possibility of half of a hole on the end of your sheets. 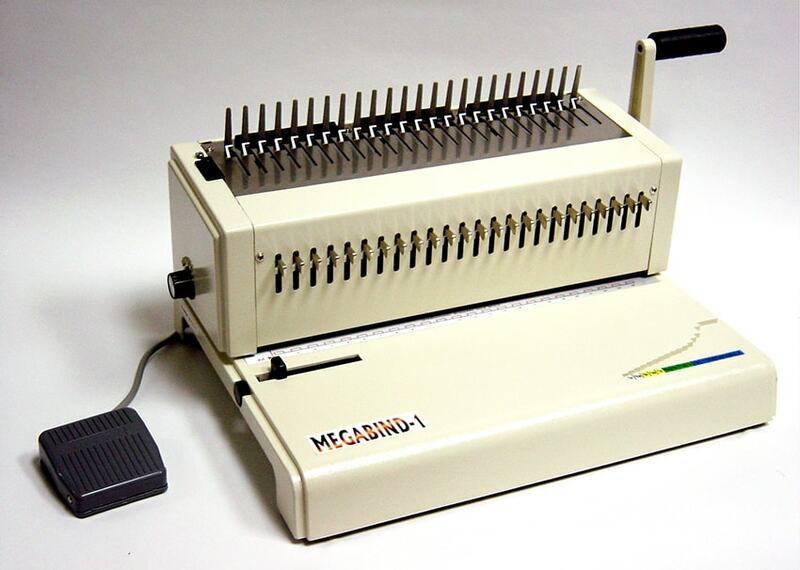 With a punching speed of up to 5,000 sheets per hour (or up to 250 books per hour), the Akiles MegaBind 1E Plastic Comb Binding Machine is the perfect addition to any large office or production facility that is looking for to combine ease-of-use with speed and efficiency. • The 20 sheet capacity (20 pound paper) is in the high range for binding machines in this price range. • The 14” binding edge lets you punch and bind documents up to legal size. • Electric punching speeds production, allowing you to punch up to 5,000 sheets per hour, or up to 250 books per hour. • Economically priced for an electric plastic comb punching machines. • Fully disengageable pins allow for perfect punching patterns, no matter what size you book is. • Closed throat does not allow for punching of sheets any larger than 14". Machines with open throats can accommodate larger sheets sizes with just an extra punch. TIP: For every 8 hours of use of the MegaBind 1E, we recommend that you punch scratch paper that has been sprayed with WD-40 or similar lubricating oil. This will keep the punching pins lubricated and help prevent residue build-up which can result in dull punching.